MSSQL to MySQL database converter software converts Microsoft SQL database records into MySQL database server record format. Database conversion tool facilitates to convert entire database or selected table’s records of MSSQL into MySQL as per user choice. 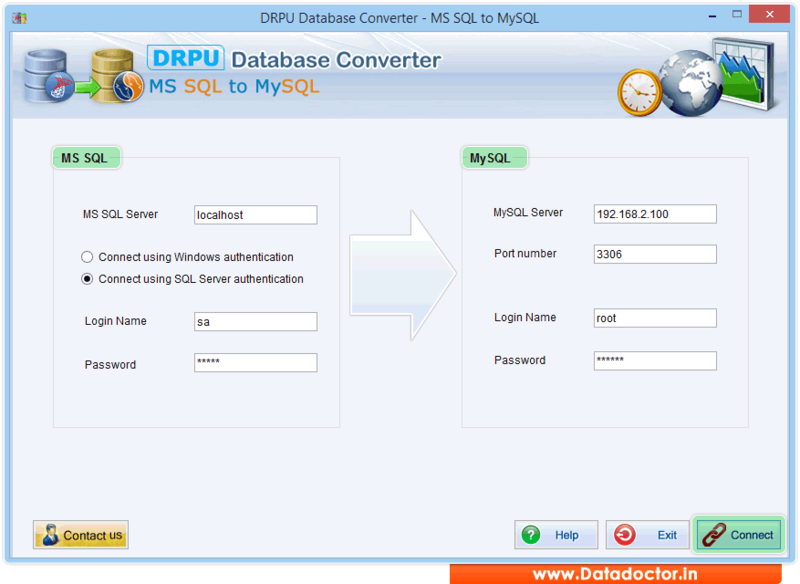 Database converter utility is capable to perform database conversion easily and accurately in both cases when user wants to export MSSQL database into new database or overwrite the contents of existing MySQL database. Application tool converts Views, Indexes with all neccessary attributes and stored procedures. Software also provide option to convert database using manual option by selecting schema items "manually". Database record converter tool supports default value including null value, primary key, unique key constraints of MSSQL and MySQL database server. » Utility converts MSSQL database into MySQL database server record format. » Supports indexes and default values including primary key, null values or unique key constraints with all necessary attributes. » Facilitates to convert entire database or individual table records of MSSQL into MySQL as per user choice. » You can connect MSSQL and MysQL Server locally or remotely. » Supports all major versions of MSSQL and MySQL database server with all data types attributes.